This is definitely one of those ‘just in case you’re Googling for it’ posts! Regular readers will know that in the spring, we bought a campervan: a 3-year old Bilbo’s Nexa based on a long-wheelbase VW T5, and we’ve had great fun with it so far. You can read more about it in an earlier post. 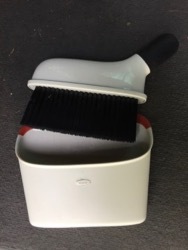 A common temptation amongst new van owners is to purchase far too many accessories immediately and then use only a fraction of them, a temptation that we, surprisingly for us, managed mostly to resist. But there are a few things we’ve been particularly pleased with, and some of them were chosen after extensive research, so I thought a list might be useful to others. 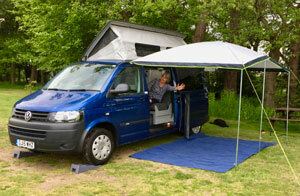 They range from the only-useful-for-Bilbos-Nexa to the handy-for-any-campervan variety! This makes climbing in and out of the van just that bit easier, especially if you’re on sloping ground and your door is higher than usual because of levelling ramps. 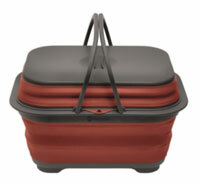 It doesn’t provide a huge amount of height, but it also folds up nice and small. We got ours from Amazon. 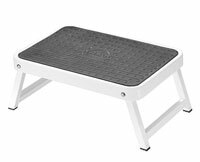 Perhaps the bulkiest thing that everyone needs to carry is a set of levelling ramps. We got the Fiamma ones, which work fine, but I imagine others are much the same. What I do recommend, though, is getting the chocks to go with them, or making yourself something similar, even though they’re a bit fiddly. Why? Well, on most VW vans, when you want to rotate the driver’s seat to face backwards, you need to let off the handbrake. You can put the van in gear (or in ‘park’) before doing so, so you’re not going to roll anywhere very far, but if you’re up on ramps, you’ll probably roll far enough to lose a noticeable chunk of your carefully-adjusted height! Chocks are the solution. Using them is rather tricky, of course, if you’re on your own, but, in that situation, you may not care so much about rotating the driver’s seat anyway. Visiting Scotland over the summer, we decided we would need some midge-free ventilation. Midges are pretty tiny, and some flyscreens won’t keep them out. We bought a pair of these from Jerba, who are based in Scotland, so we figured they should know what they were doing. And they did. Check with them for the precise details for your windows, though; you do want them to fit well! 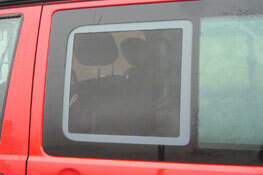 For more general ventilation in hot weather, we also got some of these from Brandrup for the front windows. 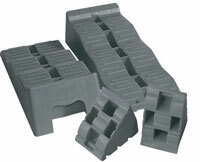 They’re bulky, a bit inconvenient to carry, and slightly tricky to install. But they do have the advantage of providing ventilation while maintaining security – occasionally useful when leaving the dog in the van. Whether or not you actually have an awning, when the ground gets wet, you’ll probably want some sort of a doormat between you and the mud. 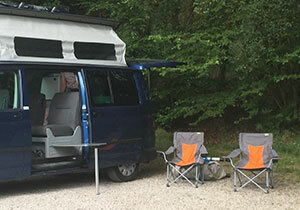 When we rented a van before buying, it came with some of this permeable rubber mat, which really proved its worth after a few rainy nights, so we asked them what it was and where to get it. The rain goes through it, rather than forming puddles; you can have a large area and still fold it up small; it’s easy to hose down afterwards; and, apparently, some campsites only let you pitch things if you have a groundsheet that won’t kill the grass in the process. This meets that criterion too. There are lots of sources for similar stuff, but we were pleased with the sheet we got from eBay. It even matched the van! 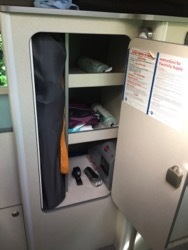 Our van does have a loo, but it’s in a cupboard and you have to pull it out to use it. On the rare occasions when we’ve stayed at sites without WC facilities, we prefer to have a slightly less intimate arrangement! You can buy cheaper loo tents than Khyam’s one, but theirs is very well made and easy to put up, and I have no regrets about spending a bit more. We found that using our portable loo in it was a much more civilised experience than we’d expected. On our longer summer trip, we were carrying things like kayak paddles, awnings, chairs and loo tents, so we decided to use a roof rack and roof bag. One challenge when compared to car travel, though, is that our roof is two metres off the ground, and while was possible to reach it by, say, standing on the tyres, life became very much easier once we got one of these. 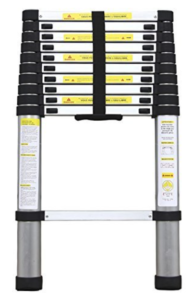 After we returned, we also found this was a lot easier to move around the house than any of our other ladders! A handy piece of kit. One thing that’s changed since my childhood camping days is the availability of a huge range of collapsible implements made of silicon rubber. We have a collapsible kettle for using on the gas ring, for example (though at most sites we have electric hook-up and so use this rather sweet little electric kettle). But my favourite is this combined bucket, washing-up bowl and draining board, which comes in a range of different colours, collapses to be almost flat, and does its job very nicely. Ours is a more subtle cream colour! One unexpected benefit of the silicon feet is that, when collapsed, it doesn’t slip around, to the extent that we just leave it out on the worktop when driving. There’s a helpful video about them here. Here’s a small, expensive piece of blue plastic. What is it and why would you want one? Or why, at least, would the owner of a Bilbo’s campervan want one? 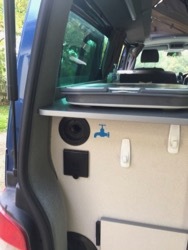 One slight eccentricity of Bilbo’s campervans is that they have the fresh-water filling point on the inside. 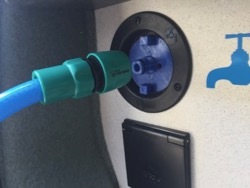 I’ve heard various explanations for this: it reduces the likelihood of accidentally putting diesel in your water tank, it reduces the chance of freezing in low temperatures, and so on, but I suspect it’s chiefly down to a much simpler installation process. It does mean, though, that filling up with water involves pointing a hose at the inside of your van, and if you’re on your own, managing to keep this in the hole and avoid spillage while you go and turn the tap on or off can sometimes be a challenge. 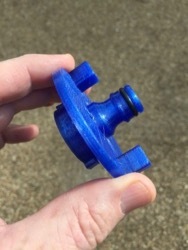 This little widget, which I think the seller produces in small quantities using a 3D printer, lets you connect up the hose and then holds it in place, and keeps the water pointing in the right direction! As an aside, my hose has a stop valve on one end of it, which only lets water through once something is connected. Very handy. I bought the hose ready-made, without noticing this, and it caused me some confusion until I worked out what was going on! 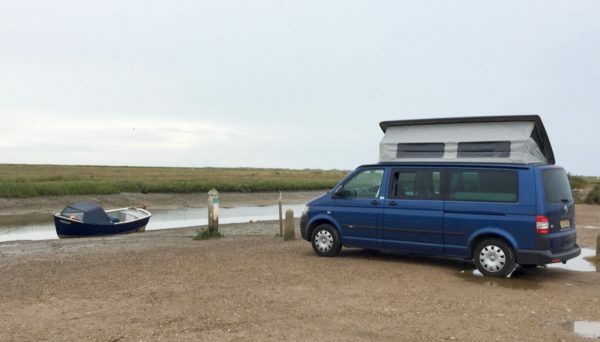 In a small van, it can be a challenge getting things dry, especially if, like us, you tend not to spend much time relaxing at the campsite, but instead are always on the move! So wet towels were a bit of a problem, until we discovered these. 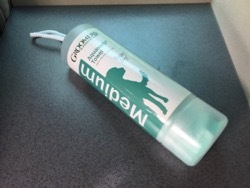 They are really intended for dogs, but, having bought one for Tilly, I thought I’d just try it in the shower myself, before she got to use it. We immediately went and bought two more for ourselves. These are not big fluffy luxurious things in which to wrap yourself. They are more like a kind of super-absorbent imitation chamois leather. You rub yourself down, wring it out, and repeat until you’re dry enough. But they take almost no space in the van, and, best of all, they are meant to be put back in their sealed containers while still moist. So the whole problem of what to do with the wet towels goes away. Update, a couple of months later: Oh yes, and these are absolutely fabulous for removing condensation from the inside of your windows, too! Tiny, cheap, well made, and it does the job nicely. Not much else to say! Available from many places including Amazon. 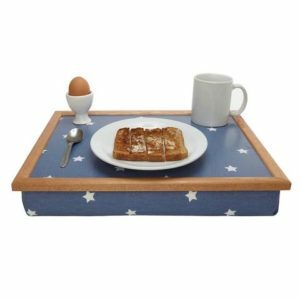 Now, I tend to think of lap trays as something for the old folks’ home rather than for the campsite, but we got a couple of these ones from the delightfully-named gift shop ‘Not Another Bunch of Flowers‘, and they’ve been excellent in the van. We use them whenever we don’t have the table up, when we’re sitting outside, or when for some reason we just want a little bit more solid, flat space on which to put things. I also like the fact that they don’t have cats, flowers or Constable landscapes on them, which makes me feel a bit less old. It’s always nice to be able to sit outside, but chairs can be a nuisance to carry around, unless you have a VW California, which has handy storage for them in the tailgate. We ended up going for Kampa Cocktail chairs, which are a bit lower than we might otherwise have chosen, but have the benefit of being really quite compact when folded. Bilbo’s Nexa owners, in particular, might like to know that we bought them after considerable research to find something that would fit into the Nexa’s wardrobe, without simultaneously being so small as to have you sitting on the floor! They are fairly low, though – we really need to find a small low table to go beside them for the G&T. 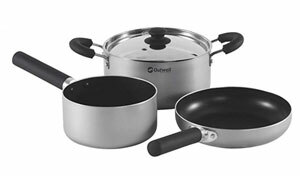 Lastly — for now, at least — we needed some pots and pans, and we’ve been very pleased with this little set. The handles unscrew, and it all stacks together in a very small space, whilst feeling reassuringly solid once assembled. So there you are – those are some of our favourites after the first six months or so. Hope they’re useful to somebody out there!